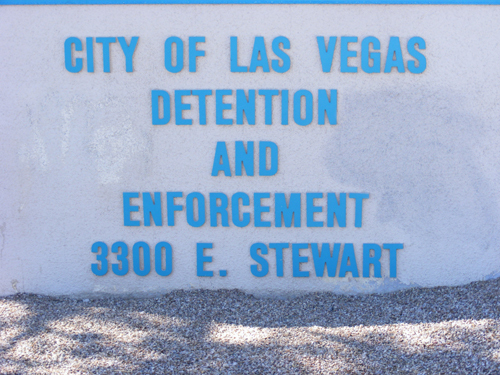 The Clark County Detention Center inmate search service number is 702-608-2245 and is located at 330 South Casino Center next to the Golden Nugget Casino in Downtown Las Vegas. It is a short walking distance from the famous Fremont Street Experience going south on Casino Center Blvd. When you walk in the main entrance you have to go through metal detectors. The bail window is closed from 12 midnight until 8am. That means that no bonds can be posted during that time period. If your friend or loved one just got arrested they are most likely at the Clark County Jail, which is the largest Jail in the greater Las Vegas area. Once they get arrested and transported to the County Jail they will be processed or booked in. The booking in process can take a few hours to up to five or six hours depending on how busy the jail is. The Clark County jail is the busiest jail in Las Vegas and its massive towers cannot be missed in the downtown area. The jail usually releases defendants on the backside of the building through massive grey gates that are marked “Transfer/Release”. Call 702-608-2245 to find someone who just got arrested or click here for Online Bail Bonds in 3 minutes or less click here. 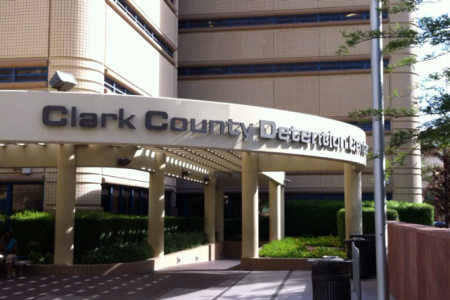 The address of the Clark County Detention Center is 330 South Casino Center in Las Vegas, Nevada. eBAIL services the greater Las Vegas valley including Summerlin, Green Valley, Henderson, Spring Valley and North Las Vegas.